Pan-Seared Steak with Cognac Sauce – Perfectly pan seared Top Sirloin Steaks topped with a deliciously creamy cognac sauce. 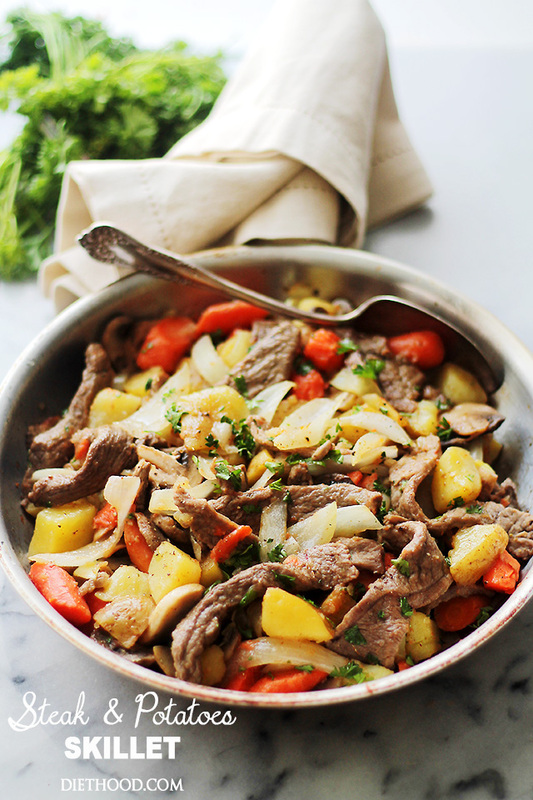 You’re only a few ingredients AND minutes from having the best steak dinner of ever. ever. everrrr. Hello, my dear loves and lovebirds! Happy Sunday! Happy Valentine’s Day! What are your plans? Where are you going? Who is proposing? Who is singling? DO tell. I want to know! 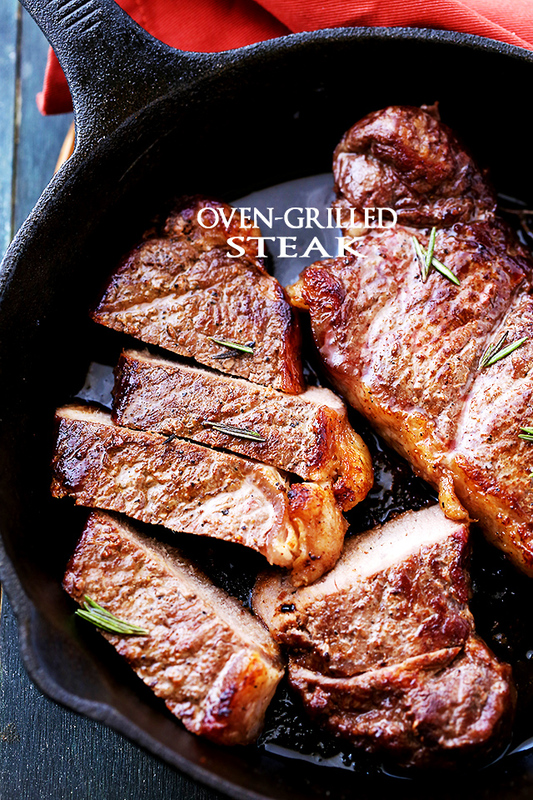 Me, myself and I will be at home, chillin’ with my handsome Valentine and the kids, enjoying big bites of this wonderful Pan-Seared Steak. Don’t be jealous. Also? There’s cognac in there. If you’ve been following me for some time, you know that I’m constantly on a quest to find a new favorite recipe. Or at least keep things interesting and exciting with things other than chicken. This has been a goal for years. Steak is something I always experiment with; grilling it, ovening it, pan-searing it. Or what I can flavor it with or what can I stick it in… like fajitas. or this Pan Seared Sirloin Steak with Mushroom Sauce, or whatever else I can think of. I should also note that, while wine is my number one, cognac in cooking makes it a close second. I absolutely love the flavor that it adds to food. 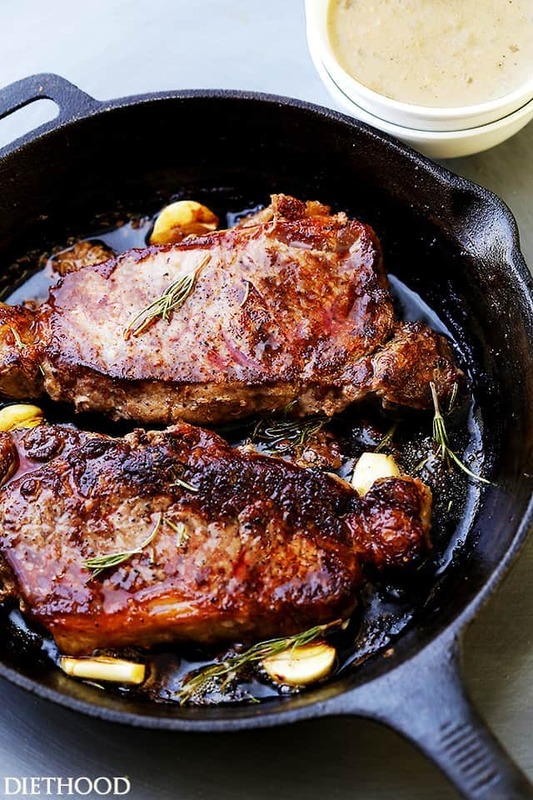 My key for cooking steak in a cast iron skillet is butter, olive oil AND fairly high heat. I want that skillet to be HOT, and once I throw the steak on there, I don’t touch it. I fight my impatience for a few minutes, trying really hard not to flip the steak every second. Also, for the reason that I will not touch steak if it’s not overdone – basically, if I see blood, in my head, it’s still alive – I have to keep mine on there for several minutes, about 6, before turning it and waiting another 6 minutes. However, IF you love your steak red and bloody (WHY), give it around 3 to 4 minutes on each side. Please, also know that steak is not safe to eat until it reaches an internal temperature of 145F degrees with 3 minutes rest-time afterwards. Got that? Good. And about that sauce? Grab the bottle of Courvoisier or Hennessy – things are about to get firey! Hope you all have the best Valentine’s Day of ever! Perfectly pan seared Top Sirloin Steaks topped with a deliciously creamy cognac sauce. Prepare steaks by seasoning with salt and pepper. Liberally salt the steaks on all sides. Set aside. 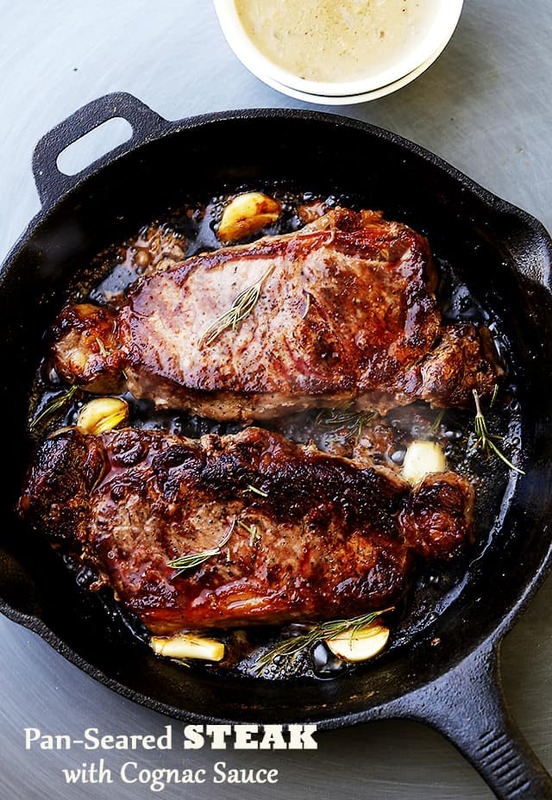 Add butter, olive oil, rosemary and garlic cloves to a cast iron skillet and melt over medium-high heat. 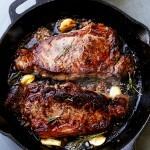 Add steak to skillet and cook until brown and cooked to desired doneness, about 4 minutes per each side for medium-rare. Transfer steaks and garlic to cutting board and let steak rest for a few minutes. Discard rosemary sprig. Remove skillet from heat and gently pour the cognac into the hot pan and ignite with a lighter. Shake the pan until the flames die out. DO NOT stand above the pan when lighting up the cognac. Stand back as far as possible, while holding on to the handle. Return the skillet over medium heat and add the cream to the cognac. Bring the mixture to a boil and whisk until the sauce thickens. 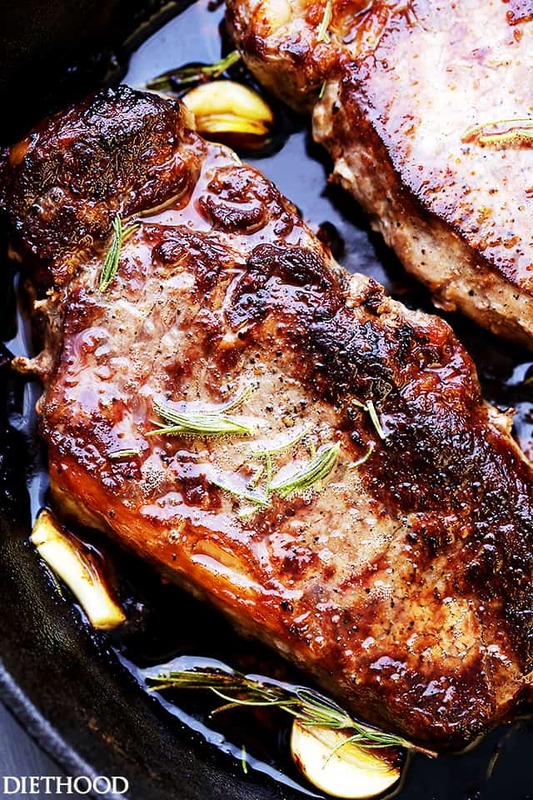 Cut up the steaks (optional) and pour about 2 tablespoons cognac sauce over each steak. 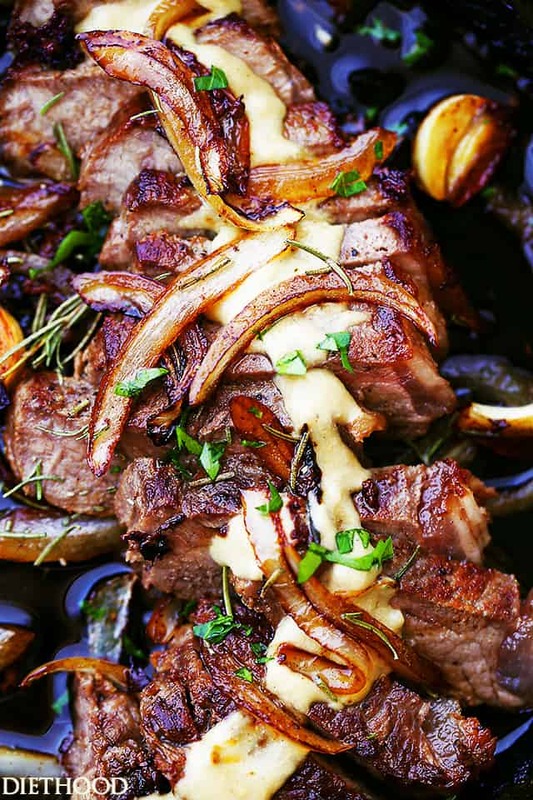 Optionally, you can serve the steaks with a side of caramelized onions and/or mashed potatoes. Katerina, I so agree with you about doneness. No rare (raw) meat for me, thank you. And rare steaks have not been cooked long enough to have any flavor. I think a lot of people have simply been served overcooked steaks at some point in their lives and they think that is what well done or medium well means; it does not. Your steaks look great! This is a gorgeous steak!! My hubs is one of those rare steak guys, so thanks for the tips. But I’m like you, I much preferred mine cooked, and this looks perfect! Oh my gosh, this is positively swoon-worthy, YUM!!! This is stunning! Seriously gorgeous. 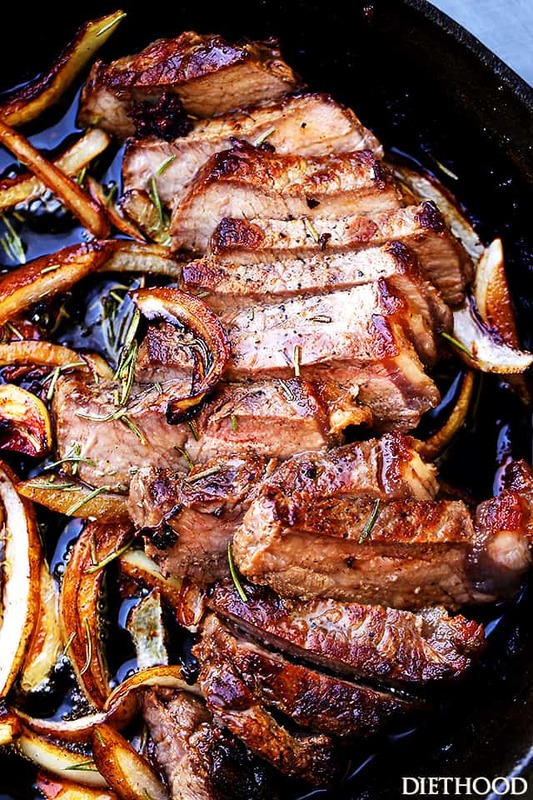 So wishing I could reach through my screen and take a bite of these steaks, Kate – they look incredible! This looks so amazing – i’m making it as soon as possible! Oh good Lord, woman. That sauce is seriously calling my name! This looks incredible! My husband is going to love this one! That is some gorgeous looking steak! I’m a huge fan of the olive oil, butter, and cast iron combination myself; you can’t go wrong with it. 😀 Great recipe, Katerina! This was amazing! The whole family loved it! This will be a staple on my monthly menu!!! Love you Katarina! cast iron skillet? I’m going to stop reading you! (LOL) Never..
Those steaks are beauties … the sauce sounds pretty decadent.